If your family owns firearms, it might be time to talk to your children about gun safety. Firearms instructor Kevin McNair teamed up with the Nevada Department of Wildlife on Saturday to hold gun safety seminars for families and said it’s important to talk about firearm safety with children. Because whether a home has guns in it or not, children could come in contact with guns at another home. And when children have accidents with firearms, the results are too often tragic. 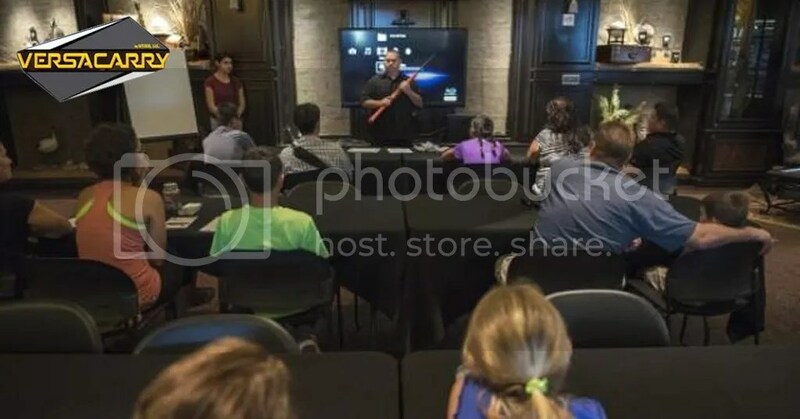 Five families sat in on the first seminar at Bass Pro Shops, 8200 Dean Martin Drive, at Interstate 15 and Blue Diamond Road. The group, which included children as young as 5 years old, watched a movie, took turns reading gun safety information and talked about safe firearm behaviors. Cierra Zach, 27, and her son Trevin were visiting from Kingman, Ariz., and decided to stop by after hearing about the class from a friend. Trevin is taking a hunter education class at home and said he has heard the gun safety rules before. “It’s always good to have a refresher,” Zach said. Trevin said he and his friends often use Airsoft guns together, but the 12-year-old takes safety seriously. They wear bright colors, stand next to each other while shooting and never point their guns at other people, he said. When asked during the class if smaller bullets are less dangerous, Trevin said no, because it’s still a projectile. And Trevin is serious about another gun safety tenet. “Don’t mess around with your parent’s guns,” he advised. Rick Briggs, 47, of Las Vegas, brought his 5-year-old son, Kevin, to the class. “I’ve been hunting since I was his age,” he said, adding that while he keeps his firearms secured from children in a safe, it’s important to remove any mystery or the “curiosity factor” a child might have about guns. Sometimes when he is cleaning a gun, he talks to Kevin about staying safe, Briggs said. “It’s not a toy,” Kevin chimed in. McNair advised parents of the best ways to keep guns locked up and out of their chidrens’ hands. He gave the families firearm cable locks and gave the children certificates for them to sign and give to their parents. As part of the “Project ChildSafe Pledge,” the children have to promise to never handle a gun without permission from an adult they know, never play with guns, and always obey the rules of gun safety. “If I find a gun, I will not touch it; I will tell a grown-up right away,” the pledge reads. “And leave the area,” McNair added. The Department of Wildlife’s Ken Marlow, who also teaches hunter education classes at Bass Pro Shop, said the first four hours of the class focus on firearm safety. Even if a person isn’t getting a hunting license, he encourages people to stop in with their family. “I will never turn away people if I have the space,” he said. McNair said he wants to make the family seminars a regular event. “It’s going to pick up momentum,” he said. For more information about family firearm safety, visit http://www.projectchildsafe.org.